... included in our Full Premium Home Inspection. At Gateway we understand that your referrals are a reflection onto your own business. Our inspection referrals are pain free. With E-KEY access and showingtime.com it is a seamless process. Our convenient scheduling (PHONE (763) 219-3122) or 24 hour internet availability can help free up precious time in this busy market. You can be reassured that Gateway’s inspections meet and/or exceed the rigorous standards of InterNACHI. Our comprehensive non-invasive visual inspection is performed with professional courtesy and tailored to our clients needs.A home inspection from Gateway will provide our client with the sense of understanding, so they can make an informed decision and plan for enhancements. 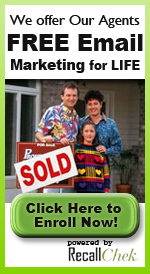 We offer our agents Free e-mail marketing for life. Gateway has teamed with moveincertified.com to provide the best service for pre-listing inspections. Move In Certified homes have been pre-inspected by Gateway and the sellers confirm that there are no major systems in need of immediate repair or replacement and no known safety hazards. All of this is combined with our comprehensive reporting system including pictures, illustrations, & hyperlinks. This web based program makes our reports easy to read, understand and share. You can rest easy knowing that you will be well represented though the eyes of your client with a positive experience and peace of mind.